A largely African American audience vented their anger and frustration – some directly at police officers and other officials who were members of a 10-person panel as part of a townhall event called “Philly After Ferguson” – stemming from systemic intransigence over law enforcement accountability and lack of transparency. 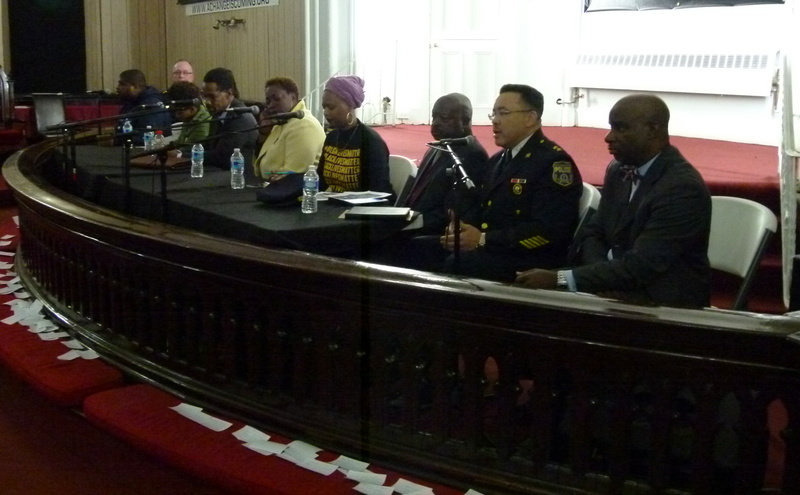 Panelists included SEPTA’s Chief of Police, Thomas J. Nestel III; Philadelphia’s civilian police oversight board head Kelvyn Anderson; the Philadelphia Police Department’s Deputy Commissioner of patrol operations, Kevin J. Bethel; Daily News Editor-in-Chief Michael Days; and organizers from Philly’s Black Lives Matter movement, among others. Tanya Brown Dickerson, the mother of slain 26 year old Brandon Tate Brown, was also in attendance. She gave remarks before the audience Q&A began, urging police officials to release video from a gun shop in the vicinity of where her son was gunned down by police during a traffic stop on December 15th of last year. During the Q&A period itself, Ms. Dickerson addressed all government official panelists by name with the question “How many of you would be happy with learning of your child’s death from the media?” She said that she had first learned of Brandon’s death on the radio the morning after he was shot. Much of the collective anger from the pews was directed along with demands for transparency from the police, and specifically from Deputy Commissioner Bethel, regarding Brown’s death. The crowd chanted repeatedly “Who killed Brandon Tate Brown?,” a question that has been echoed in social media by activists who believe the department should release the name of the officer who fired the shot killing Brown. He also apologized to Ms. Dickerson for the manner in which she learned of her son’s death, telling her it was unacceptable that she heard from the news instead of being notified in person by an officer, as is department policy. Kelvyn Anderson addressed his experience with Philadelphia Police Department transparency regarding officer-involved shootings since he became Executive Director of the PAC in early 2013. “In Philadelphia this is a pre-Ferguson question,” he told the audience last night, describing how in 2013 he began by “[writing] to the Commissioner to say that we want to see all of the data on officer-involved shootings.” Ramsey notified the Commission that he was formally opposing their request, and Anderson says they have been seeking access to it ever since, as they are entitled to the data under the Executive Order creating the PAC. Anderson also raised the issue of the Justice Department’s COPS report, from which the police department has received a list of recommendations. None of the review has been publicly released, although The Declaration‘s Austin Nolen was told by a Justice Department official this morning that it will be released in March. The meeting continued well past its scheduled 7:30 closing, but unfortunately angry frustration and some outright heckling from the audience prevented dialog from thriving. In a brief three-minute respite from verbal abuse, Chief Nestel of the SEPTA Police began to detail his plans for bold reform in his department, including a body-camera footage review board with civilian representation.